Westshore Boulevard is the primary north-south thoroughfare through the Westshore Business District. Over the years, the Westshore Business District has become the largest employment and retail center in West Central Florida. With a suburban style development pattern, Westshore Boulevard is a busy street with outdated accommodations and many design features since it was developed in the 1960s. It is actually a county road that runs through and is maintained by the City of Tampa. Recent private development projects, have been changing to more of an urban development pattern, with the front of buildings located next to the public sidewalk. New infill development projects adhere to overlay district architectural standards. These standards and increased density have encouraged the use of other modes of transportation beyond the private automobile. 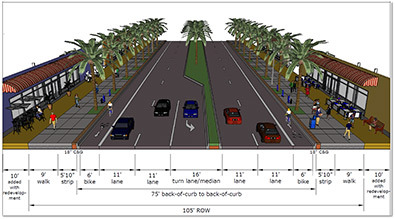 With input from the Westshore Business Alliance, the City of Tampa retained a consultant to identify opportunities to makeover Westshore into a “Grand Boulevard” between Kennedy Boulevard and Spruce Street. After evaluating the feasibility of improvements for other modes of travel and to improve aesthetics along this primary arterial, recommendations include wider sidewalks, bike lanes, landscaped medians, burying overhead utilities, lowering the speed limit and reducing the road to four lanes. The study found that doing so would increase travel times by only 4.4%. It also recommends deleting the six-laning of Westshore Boulevard from the MPO’s 2035 Plan. Funding will have to be identified before these recommendations can move forward. For more information contact Lisa K. Silva, AICP, PLA, at 813/273-3774 x329.